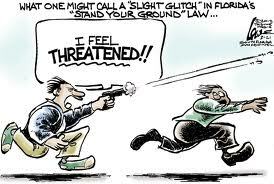 Since George Zimmerman killed Trayvon Martin, a lot of attention has been paid to Florida’s “Stand Your Ground” laws. People have written about the effect of abundantly available guns on public safety, about the effect of the American Legislative Exchange Council (ALEC) in pushing this law in Florida and several dozen other states, and, of course, the success of the National Rifle association in supporting such laws. I want to write about what “stand” means. “Stand” is a good word. I am sure the person who thought up what to call this law knew that. Think of “taking a stand.” (Not “taking the stand;” that’s a different matter entirely). All the meanings of stand that are paired with “up” are good: stand up for yourself, stand up for America, stand up to bullies. These are all metaphorical. Stand up for the national anthem is, again, another thing entirely. Even “stand your ground” is good when conceived in a moral sense. Think of Martin Luther’s “Here I stand; I cannot do otherwise.” Standing your ground often means taking the right stand and refusing to be moved off of it by “the bad guys,” whoever they are. Standing your ground is absolutely essential in warfare with muskets. If you don’t stand there in the face of withering musket fire, you’ve already lost the battle. North Carolina came to be called the Tarheel State because their soldiers stood their ground in battle. It was, an observer commented, as if they had tar on their heels. So, apart from the rich history of the phrase, what does “stand your ground” have to do with the killing of Trayvon Martin? It is time to ask, “‘Stand your ground’ rather than what?” I think the namers of the law want us to think “rather than retreating like a coward” or rather than “shrinking from the coming conflict.” In fact, according to an account I heard from Emily Bazelon on the Slate Political Gabfest, the law in Florida before “stand your ground” required that a person retreat from potentially deadly conflict if it were possible. All courses of action that didn’t lead to conflict and loss of life were to be considered before lethal conflict was legally tolerated. If you killed someone in such a situation, the question for the court would have been whether you could have done something else under the circumstances. Now, by contrast, the question is only whether you had reason to feel endangered. This is an easier case to make, of course, if the person you thought might be a danger to you is already dead. There are some places where there is no reliable retreat, like your own home for instance. 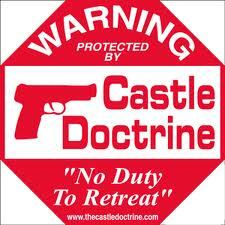 The presuppositions of the law were all reversed there according to (Emily Bazelon again) “the castle doctrine”—named for the precept that “a man’s home is his castle.” So the law before “stand your ground” required you to act in a way that would prevent lethal conflict unless you were in our own home. Does “standing your ground” require you to allow the other guy to draw first? Hundreds of westerns to the contrary, no it does not. To defend the ground you are on, you are allowed to pull your gun and fire if you feel there is an imminent threat. And more situations are likely to be understood in terms of imminent threat if you have a gun on you. Having the gun steers your perceptions and your immediate rationales in the direction of threat. Being armed, in other words, makes you more likely to feel threatened and, at best, deterrence, and at worst, killing the other guy first. So both the way your mind codes the situation and the way having a gun lowers the standard for “threat” moves your hand in the direction of the holster. Evolution has programmed us instinctually for “fight or flight.” The Florida state legislature thinks that is one instinct too many. This entry was posted in Political Psychology, Politics, ways of knowing and tagged castle doctrine, Florida, stand your ground, Trayvon Martin. Bookmark the permalink. THanks for this post. Such a sad case. Crazy how the law was passed. I wonder if people thought of a scenario like this before they voted. What would it take to modify the law or change it completely? I wonder if that would be the next course of action for Trayvons family…to make sure somehting like this does not happen again. I was so surprised to learn that Oregon is a “stand your ground” state as well. Bette’s out rummaging around to find our just how OUR beloved state could have done such a thing. At first glance, it sound like the kind of thing Eastern Oregon and Southern Oregon and Coastal Oregon could have required of the Willamette Valley legislators. The Willamette Valley, where 80% of the population lives, will always have the legislative majority, but not all the WV districts are liberal districts. The implications for gun-related homicides are very clear and, in some charts I saw but did not confirm, already in the record. I’m so glad you liked the post, Melisa. Do you know how many states have Stand your Ground laws? Can it be repealed? The number that comes back to my mind is 23. That’s within a few of the right answer. All of them are ordinary statutory law. All if would take is a single legislative vote to repeal it. I’m going to poke around a little into the story of Oregon’s passage of that law and see what I can find out.